Instead of regular flour tortillas we used corn tortillas. They make all the difference in adding an authentic Mexican flavour. We filled them with pulled pork we slow cooked on the weekend (12 hours in the slow cooker) and served them with avocado and a salsa we made using tomatoes, mango and parsley. Corn tortillas are much thicker than flour ones so we we heated them up in a pan in order to soften them and be able to fold them. After they were stuffed with the seasoned meat, they baked in the oven for about 15 minutes. We topped them with salsa verde to add a bit of heat. Ground cumin added the perfect flavour to the meat and we didn't have to use a store bought packet of seasoning that usually contains a lot of salt. 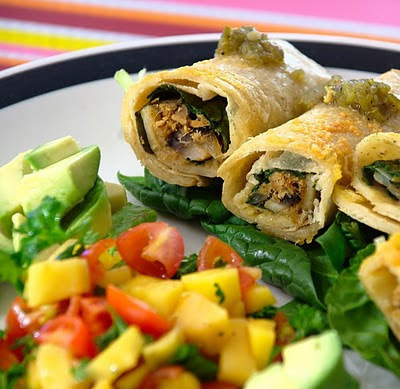 Each tortilla is about 70 calories so it is a relatively healthy meal depending on what you serve it with.